There are still some days of Sanfermin 2016 remaining to be enjoyed but one of these days it will unfortunately come to an end. So, if you finish up all spent out and ready for a complete change, we suggest a nice getaway plan to renew your spirits. As the summer sun starts to roast us in earnest, we will head off to the beach at Mundaka (Bizkaia). Because they are holding a very appealing Festival there in which Kukuxumusu is also collaborating and taking part in with its drawings and other such like merchandizing stuff. Music and good food. 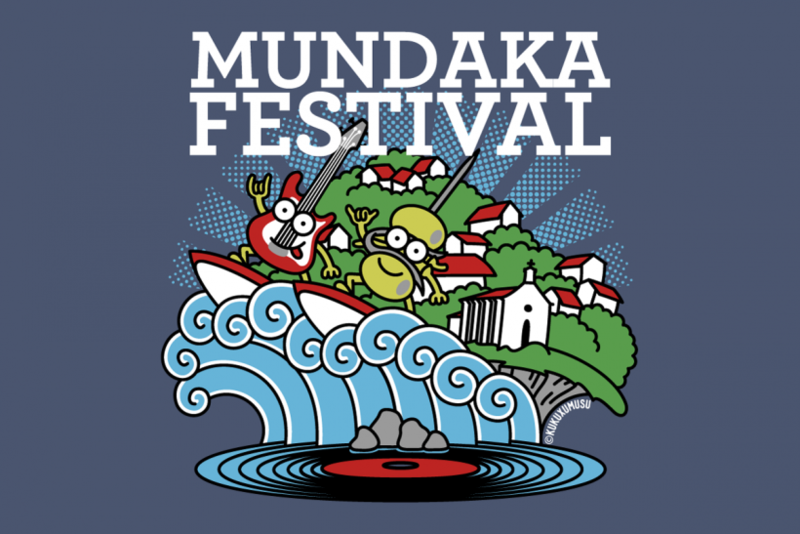 That is the main menu of the Mundaka Festival program, so not a bad reason for signing up for the event. From the 28th to the 30th of July it will all be happening on the Paradise island of Santa Katalina. We will stuff ourselves with good food and take neoprene in order to surf to the rhythm of rock&roll. Three full days to get high on waves, tapas and txakolí. Surfers, musicians, chefs, dancers, revelers and nature lovers can all come together here right in a nature reserve setting in Urdaibai. If you can find an excuse for a visit, you are probably already checking out the tickets. In the drawing that we have made for the festival we wanted to capture most of the things that you will find around there. The Mundaka Festival celebrated its first edition last year and it was recognized in the Iberian Festival Awards as best-new festival and the best one in terms of an environmental format. For sure, the 2016 standards will be equally high or even better. The programming for this second edition is a very tempting offer as can be seen in this video. And, of course, as you probably know, Mundaka has some of the best surfing waves in Europe. Its left wave attracts visitors and surfers from all over the world. This wave can sometimes reach 3 or 4 meters in height and there are some 400 meters of coastline. As it comes in the form of a tube, you can enjoy it even more from the inside. Surfers of renown such as Marck Occhilupo, Kelly Slater (to whom we have dedicated a drawing here at Kukuxumusu) and Andy Irons have all surfed the Mundaka waves with pleasure that puts these waves on a par with Hawaii itself, where this sport originated. The festival organizers have also prepared lots of interesting and fun activities that can be enjoyed in this region. An air trip by light aircraft, a trip up the inlets of Bizcaya, a visit to vineyards or a gastronomic route to visit some good bars and restaurants. But perhaps the best recommendation we could make would be to join up for some surfing classes, if you feel up to it. That is to say, if you are ready for the ‘sup’, which does not mean– “super” anything but rather the more mundane “stand up paddle surf” with that idea of standing on a surfboard and rowing. Not as easy as it looks but very pleasing if you can keep your balance for a minute or two.